The Shimansky Starlight diamond jewellery collection celebrates the beauty of nature’s most precious gifts: the stars, and diamonds. Inspired by the sublime beauty of the night sky, the Starlight Collection captures the essence of the stars, a brilliant wonder of nature. Glistening with fire and brilliance, each jewellery creation in the collection radiates the energy and personality of the woman who wears it. Available in four different shapes, the Starlight Collection captures the beauty of the stars in rows of concentric diamonds. The round Starlight ring offers a classic and more traditional look, while the cushion-shaped Starlight ring is slightly edgier, and offers an alternative to the popular round design without straying too far from a conventional shape. For the romantic, the heart-shaped Starlight ring offers the promise of forever, while the marquise-shaped Starlight ring offers an unrivalled elegance synonymous with the marquise diamond shape. Each ring has a sturdy yet graceful band which completes the statement design, and supports the striking focal point of the ring. 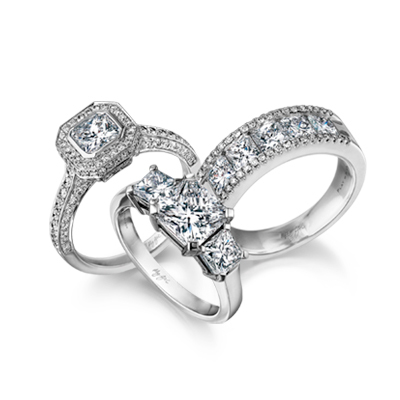 The concentric rows of diamonds glisten intensely, creating a mesmerising dance of light with every move of your hand. Catching the light at every angle, your Starlight diamonds shine as bright as stars. Exclusive to Shimansky, the Starlight Collection includes rings, earrings and pendants. Complementary to the rings; earrings and pendants complete the Starlight set, and make for stunning birthday and anniversary gifts. Each piece in the collection is available in your choice of top quality 18K yellow, white or rose gold, allowing you to customise each creation to your personal preferences and tastes. Each shape in this diamond jewellery collection offers a modern and eye-catching design, perfectly suited to a dynamic woman with a cultivated sense of style. Appealing to women who love a bit of sparkle, the Starlight Collection offers designs that are simultaneously bold, and elegant. Like the stars in the sky, each jewellery creation in the collection sparkles with an intensity second to none. The rows of concentric diamonds create a dynamic displays of light, and a twinkling that is intensified with your every move. The Starlight Collection allows you to take the stars with you wherever you go. It’s a little reminder of your place in the universe, and all the possibilities it presents to us. With the Shimansky Starlight Collection, the sky isn’t the limit – it’s just the beginning. Stars have fascinated mankind since the beginning of time. Millions of miles away in an infinite universe, these heavenly bodies glitter spectacularly, leaving those who gaze upon them, mesmerised. Like the stars in the night sky, diamonds have beguiled us for hundreds of years. Undeniably beautiful, and somewhat mysterious, diamonds are one of nature’s oldest and rarest gifts. A universal symbol for everlasting love, diamonds mark milestones, celebrate anniversaries and bring soulmates together through engagements and most importantly capture and preserve those special moments in your life. Beautiful and captivating, it is no surprise that the night sky conjures up feelings of romance and falling in love. The perfect complement to these heavenly bodies, diamonds have been the universal symbol of love and devotion for hundreds of years thanks to their rarity, rich history and incomparable durability. The beauty of a diamond is synonymous with the beauty of a star, each one shining bright in its own right. The perfect tribute to Mother Nature, the Starlight Collection brings together the beauty of two of nature’s most fascinating gifts: diamonds and stars. Like the mesmerising twinkle of the stars, each diamond in your Starlight jewellery creation holds the brilliance you would expect from a star in the sky. A marriage between supreme craftsmanship and unrivalled artistry, each Starlight jewellery creation is made with technical precision and absolute attention to detail that has come to epitomise each and every Shimansky creation. As intriguing as the night sky, the woman of your dreams sparkles with beauty, grace and elegance. Sometimes mysterious and always spellbinding, her beauty is as radiant as the brilliance of the finest diamond. Captured in her Starlight jewellery creation, are the stars in her eyes. Discover this magical diamond jewellery collection at your nearest Shimansky store.